Losing money is difficult for everyone, but new research by Lindsay Pool, Sarah Burgard, Belinda Needham, Michael Elliott, Kenneth Langa, and Carlos Mendes de Leon in the Journal of the American Medical Association in April, 2018 show that suffering a negative wealth shock may even increase risk of death. Research has previously linked loss of wealth to short-term health changes such as increased risk of depression and anxiety, substance abuse, and suicide. Pool and co-authors use data from the Health and Retirement Study (HRS) to study the long-term effects of negative wealth shocks on all-cause mortality rates. They examine the link between suffering a negative wealth shock (defined as a wealth loss of 75% or more between 1992 and 1994) or asset poverty (having zero or negative wealth in 1992), and the total all-cause mortality rate over the twenty years beginning in 1994. The study sample included adults in the United States who were born between 1931 and 1941. In the study sample, 26.2% of people experienced a negative wealth shock and 6.9% had asset poverty between 1992 and 1994. Those who experienced a negative wealth shock or asset poverty were more likely to be women, non-white, have lower levels of household income and net worth, and be in poor health relative those who did not. 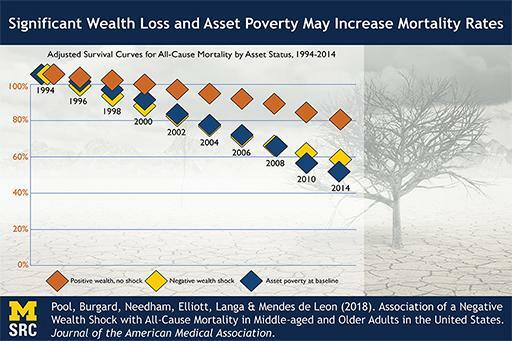 Compared to a similar person who did not experience a shock or asset poverty, the researchers found that a person who experienced a negative wealth shock had a 50% higher risk of mortality during the following 20 years, and a person with asset poverty at the beginning of the period had a 67% higher risk of mortality over that same 20-year period. Wealth shocks in which older adults lose their primary place of residence resulted in an even higher increase in mortality risk. The researchers discussed possible pathways for these associations. They stated that the stress of economic loss in one’s 50s or 60s may contribute to a higher risk of mental health conditions or substance abuse, which in turn may result in a long term increased risk of mortality, especially combined with the inability to pay for treatment. Additionally, stress due to wealth loss may cause short-term increases in blood pressure or inflammation, increasing risk of cardiovascular mortality. Indeed, their findings are consistent with all of these stories. The authors note that the passing of the Affordable Care Act (ACA) appears to have a mitigating effect on the impact of wealth shocks on mortality, since it has reduced the prevalence of negative wealth shocks caused by medical issues. This issue will be one to watch after more post-ACA data become available in the coming years. Pool, Burgard, Needham, Elliott, Langa & Mendes de Leon (2018). Association of a Negative Wealth Shock with All-Cause Mortality in Middle-aged and Older Adults in the United States. Journal of the American Medical Association.